When your awnings start changing to a strange darker color, they're definitely overdue for a thorough cleaning. But using the right detergents and the right pressure when cleaning is extremely important. 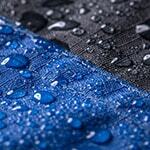 Too much pressure from your power washer can cause tears or scarring to vinyl and other fabrics. Knowing the right detergents to use can help preserve the beauty of your awnings while also protecting them until the next cleaning. When removing dirt, stains, and bug guts from an awning, consider the material you're cleaning. Aluminum awnings are more resilient, but their paint can still be stripped or faded. Fabric awnings are much more delicate and need to be treated with more care. Before applying detergent, brush the awnings to remove larger debris, dead bugs, and clumps of dirt that may have settled on them. Rinse the awnings with very low pressure to wet the surface before applying detergent. Gently brush a mild detergent over the entire surface of the awnings. For easier reach, use a long-handled pressure washer brush. Don't forget the underside of the awning. While the outside is seen more, the underside has a tendency to become home to birds, spiders, and bees. 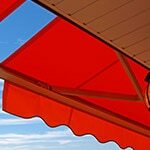 Once the awnings have been fully brushed with detergent, leave the detergent to work its magic for a few minutes. Don't leave it until it's dry though. Using a pressure washer brush is extremely helpful for brushing in detergent in hot weather. It'll keep the surface wet and soapy as you scrub. Using a pressure washer will make this job a lot easier and a lot more effective. Unlike a basic hose nozzle, a pressure washer allows you to project water further and reach higher places with ease. An ideal pressure washer for this task would be one with less pounds per square inch (PSI), but a high gallons per minute ratio (GPM). When rinsing your awnings free of dirt and detergent, you want to use as low of a PSI as possible to avoid causing damage to them. However, a pressure washer with a high GPM will apply a lot more water to the awnings, helping to remove more dirt and stains in less time. Use a very low-pressure nozzle that produces a fan-shaped output. This is not the time to break out your turbo nozzle! Fabric awnings are especially susceptible to being damaged by high-pressure cleaning. You simply want to move a lot of water to the awnings to provide a thorough rinse. Rinse in an upward motion from bottom to top, as this will prevent the detergent from running and leaving streaks. After your awnings have fully dried, you should apply a protective sealant to them to keep their colors from fading and dirt from embedding into fabrics. 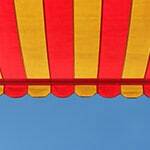 There are many good protective sealants on the market that can be used for awnings. What you want to look for are UV-ray protective sealants. UV-ray sealants will help to prevent sunlight from fading your awnings' colors. If you can't find UV-ray sealants, waterproofing sealants or even basic sealants will do. Applying a protective sealant will keep your awnings looking nicer and lasting longer. They'll keep dirt from embedding, and will help repel stains. In addition, by applying a sealant, you'll have a much easier time cleaning it in the future. The dirt will come off much easier when it's not embedded, and the soap and water will carry the dirt from the awning much more effectively if it's sealed with a waterproof protective sealant. Regarding future cleanings, you don't want to wait several years before cleaning your awnings again. Don't wait until they look horrendous, but instead aim to clean them every three months. Quarterly cleanings will ensure that the sealants don't wear away and leave the awnings unprotected, and your awnings will stay looking their best. At the very least, annual cleaning and sealing should be done to remove built-up dirt and protect your awnings from the elements. Between cleanings, periodically brush off any noticeable dirt, nests, or hives you see. Your pressure washer can be handy for periodically cleaning dirt and bird droppings from your awnings between cleanings, however always use a low pressure setting to avoid damage. Pressure Washing an Awning.. Our Power Equipment Direct how-to library can help you learn about Proposition 65 Product Labeling, Sales Tax Information and Product Recalls for Pressure Washer Equipment.